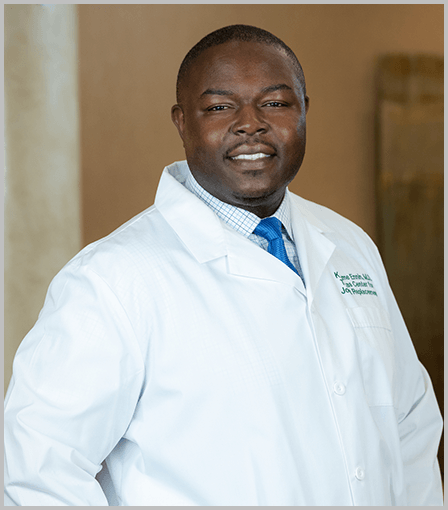 Kwame Ennin, M.D., is board-certified in orthopedics and specializes in hip and knee replacement procedures, adult reconstructive surgery, and osteoarthritis care. He joined Texas Center for Joint Replacement in 2015. Ennin earned his undergraduate degree in biochemistry from State University of New York in Stony Brook, and his master’s degree in biomedical science from the University of Medicine and Dentistry New Jersey in Newark. He then pursued his medical education at the University of Cincinnati College of Medicine, before completing his general internship and orthopedic surgery residency at The University of Texas Southwestern Medical Center in Dallas. He is fellowship-trained in adult reconstructive surgery from William Beaumont Hospital in Michigan. Ennin has served as an assistant team physician for the Grand Prairie AirHogs baseball team and for sports teams within the Dallas Independent School District. He has researched and presented on topics ranging from revision total hip replacement in geriatric patients, to treatments for periprosthetic joint infection. Modern Day Bicruciate-Retaining Total Knee Arthroplasty: A Short-Term Review of 146 Knees. Alnachoukati, O. K.,Emerson, R. H.,Diaz, E.,Ruchaud, E.,Ennin, K. A.
Emerson RH, Alnachoukati O, Barrington J, Ennin K. The results of Oxford unicompartmental knee arthroplasty in the United States: a mean ten-year survival analysis. Bone Joint J. 2016 Oct;98-B(10 Supple B):34-40.